Picture Resizer is an easy-to-use tool for batch resizing of JPG pictures and photos. Drag and drop JPG files or folders with JPG files on the application icon and they will be resized and saved next to the originals. Size of the output pictures is controlled by the name of the application. 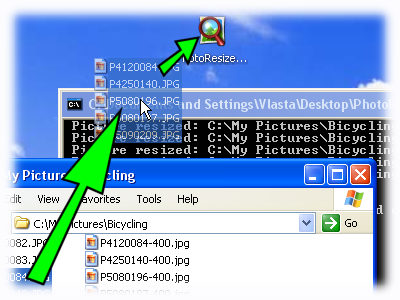 To generate 200 pixels images, simply rename the application to PhotoResize200.exe. Application can also be used from context menu of Windows Explorer. Easy-to-use tool for batch resizing of JPG pictures and photos. Picture Resizer is using high-quality resizing method, where color of each pixel is a weighted average of all covered pixels from the original image. Linear interpolation is used when zooming in. The algorithm is optimized to work with gamma-corrected pictures. Application can also be used from context menu of Windows Explorer. Picture Resizer can also crop pictures or change aspect ratio of pictures without distorting the objects in the picture by removing least significant pixels first. Convert JPG, GIF, PNG, TIF(TIFF), ICO, EXIF, WMF, BMP, EMF to BMP Picture. SmartPicture allows a picture to be worth more than a thousand words. Qweas is providing links to Picture Resizer 6.0 as a courtesy, and makes no representations regarding Picture Resizer or any other applications or any information related thereto. Any questions, complaints or claims regarding this application Picture Resizer 6.0 must be directed to the appropriate software vendor. You may click the publisher link of Picture Resizer on the top of this page to get more details about the vendor.